Have You Forgotten Your Macrame Knots? I wanted to send survival bracelets to the grandchildren but gasped at the price. Then when I really looked at the bracelets themelves I thought, well, perhaps I could copy it? What is a survival bracelet? One of the sites I read explained that the bracelets were worn by Army Rangers in Vietnam as a way to identify the Rangers from ordinary Army. Course the first thing that popped in my head was well duh, like the Rangers NEED to have something that will prove they are different? However, further reading turned up the information that the bracelet is actually just a neat,portable piece of rope! Too cool! Ten foot of rope as a lightweight bracelet. Very nice, and you don't have to worry that the rope will get tangled at the bottom of your backpack! I loved macrame so much the kids were off in their own apartments before I finally let hubby take the nail out of the doorjam! Knotting is very soothing, the cord sliding through your hands, a pattern slowly forming in front of you and it can hang there and be picked up again easily. The knots won't come loose, there are no stitches to count, no problem of needles slipping out; just tie up the loose cords off the floor and it will be fine while you wander off! Macrame is almost as easy to learn as the names of the piano keys; the knots play off different variations of the same thing and just like the piano, once you know about seven knots, the rest comes naturally. So when I looked at the knot used in the survival bracelet I thought, well geez, I remember that one! It is called the 'cobra knot' for the survival bracelet but looks like a square knot to me. The only snag I could see was the ones online are woven with one piece of cord so there are no loose ends. Either that or the knotting itself is done after the bracelet fastening is attached. If that is so then how do you untie it in an emerency? I decided not to worry about it and just go for it! The Army Navy Store! Dude, I love it, don't you? Our favorite is the one on 6th Street...where is your favorite? Course it is called a "Surplus" store now but I can't figure out why...it always had more than just Army and Navy stuff in it but OKAY, whatever, let's go shopping! Isn't it cool that the set up of the Army Navy Store remains the same? The cash register is smack up against the front door and you have to go either right or left. We always go to the right, I don't know why. Well, could be cause the caps (ones for your bald spot, not the ones that make the bombs go BOOM!) are on the right and hubby loves caps but probably cause the pins, tie tacks, etc are on the left and he knows if he steers left I will never move from that spot again! PSSSTTT! The coins are in that spot too! What? You don't think an Army Ranger would be using hot pink paracord? Well then why is it in the Surplus Store? HHHMMMM?????? Where were we? Oh, right, you interrupted me, casting disparity on the soldierly-ness of hot pink! Honestly! The eyebolt was next to find and I thought I would have to search through boxes (I was dissapointed to find that would not be necessary; so many lovely finds in dusty boxes) to find what I wanted but it was easy! In fact, they had several taped to the counter with the price tag! I think there might be more grandmoms in Tucson than I who are copying the survival bracelets! I tried to slither over to the pins but hubby knows my wiles and snagged me with a "Want a cherry Pepsi hon?" I had a small fright in the truck; I couldnt get one of the eyebolts to loosen! But hubby managed it at the stop light so all was well. Oh all right, but can you do it? Hope dies hard. It came down to simple knotting, after all. 1) Cut a two foot piece of cord. your wrist and move the knot up or down. 4) Take the remaining eight foot of cord and find the middle. 6) A Square Knot is made by curving the right hand cord over the two stationary cords in the middle then taking the left hand cord, passing it over the right hand cord then under the two stationary cords and up through the hole created by the right hand cord. What do you mean that makes no sense at all? Sorry, I thought it was funny. Made me remember what it was like to learn knotting all those years ago. I just stopped reading the instructions in the first place and just looked at the pictures! Hey! Having a masters degree does not mean you can cross the street by yourself OR follow written instructions OK? Get over it. I did. So I unraveled the pink bracelet and took pictures for all my mastered prepared peeps :) so to speak. Yes, that means that it wasn't until after I made the bracelets that it ocurred to me to write about it. I can learn, I just learn slowly...happy now? It just takes getting your feet wet again is all. Or rather, your index figer callused again. But hey! At least it isn't hemp, right? And knotting, macrame, sailors pastime or whatever you call it is a wonderful pastime. I just want to add a couple of things. 1) Remember the stationary cord in the middle. Of course you guys know you can make a square knot with only the one two foot cord folded over or with any number of cords, it all depends on how wide you want the bracelet to be...not a bad idea actually. I may have to experiment with that idea. 'Sides, I didn't get to mess around in the Army Navy Store long enough today! There are untold treasures awaiting me, I am sure of it! And the jarhead probably needs one too. DIL may like one too, never know! I like the "one thin red line" design thats on one of the websites. That might look good with four stationary cords. Or what about a flag type bracelet? Red, white and blue... that may be too wide? No it would be great, red and white as the two foot stationary cords and blue on the edges! Make a larger ball knot with the two foot cords tied together and get a wider eyebolt or another metal clasp of some kind at least an inch wide instead of half an inch like the ones for the kids! Cool idea! It isn't as obtuse as it sounds. Look at the cord in the last picture. See how the right side is straight up and down like the letter 'I?" Now look at the other side. It is curved like an oval with the closed end attached to the 'I." To keep the bracelet from twisting, you have to alternate which cord gets curled over the stationary cords and which cord goes over, under and tucked! Don't panic! Stay with me! It is easy to know which one to curl! Just curl the cord on the same side as the 'I' and your bracelet will lay flat, sharp and perfect! Have you ever done macrame? What are the perks of making a survival bracelet for your grandkids? 1) Your grandkids will have a lovely time unraveling it! 2) If you live a thousand miles away, you won't have to re-work the bracelet a million times! 3) Not to mention hearing your son (or daughter, depending) yell loudly when they step on the loose screw out of the eyebolt in the middle of the night! 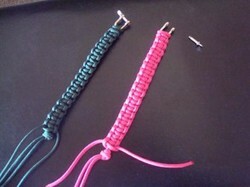 4) But really, the kids will love it and paracord doesn't fade or shrink when water hits it so they can wear it out! 5) Best of all, you work those poor old arthritic fingers which is totally important to try and keep them as supple as possible. 6) Lastly, you get a visit to your Army Navy Store! Be sure and check out all the neat pins and tie tacks and everything! They even have coins! I carry the one our son gave me from Parrish Island at all times in the hopes someone will challenge me! :) But most of all, just to feel close to our son. thank you dak! taking the pics was fun too! An informative article. I like the illustration. Reminds me of my secondary school days ah me and my friends use to be so addicted to these stuff...Its time to try them again I guess..Thank you for creating this page. Thanks @Barbarab to sharing this! wo knows maybe the two of you will make something together! too much fun! Had totally forgotten how fun we had making these when I was a kid! Will show this page to my daughter when she comes home, she will love it! it took me a few 'not' knots :) before it came back to me but the bracelets were a big hit !! Unique Fish Tanks and Accessories help show off your fish raising hobby in the best light!